And yet, even in retirement, Kepler is still providing us with impressive discoveries. For starters, NASA started the new year by announcing the discovery of several new exoplanets, including a Super-Earth and a Saturn-sized gas giant, as well as an unusually-sized planet that straddles these two categories. On top of that, NASA recently released the “last lighty” image and recordings obtained by Kepler before it ran out of fuel and ended its mission. When we finally find life somewhere out there beyond Earth, it’ll be at the end of a long search. Life probably won’t announce its presence to us, we’ll have to follow a long chain of clues to find it. Like scientists keep telling us, at the start of that chain of clues is water. The discovery of the TRAPPIST-1 system last year generated a lot of excitement. 7 planets orbiting the star TRAPPIST-1, only 40 light years from Earth. At the time, astronomers thought at least some of them were Earth-like. But now a new study shows that some of the planets could hold more water than Earth. About 250 times more. This new study focuses on the density of the 7 TRAPPIST-1 planets. Trying to determine that density is a challenging task, and it involved some of the powerhouses in the world of telescopes. The Spitzer Space Telescope, the Kepler Space Telescope, and the SPECULOOS (Search for habitable Planets EClipsing ULtra-cOOl Stars) facility at ESO’s Paranal Observatory were all used in the study. Finding the densities of these planets was not easy. To do so, scientists had to determine both the mass and the size. The TRAPPIST-1 planets were found using the transit method, where the light of the host star dips as the planets pass between their star and us. The transit method gives us a pretty good idea of the size of the planets, but that’s it. It’s a lot harder to find the mass, because planets with different masses can have the same orbits and we can’t tell them apart. But in multi-planet systems like TRAPPIST-1, there is a way. As the planets orbit the TRAPPIST-1 star, more massive planets disturb the orbits of the other planets more than lighter ones. This changes the timing of the transits. These effects are “complicated and very subtle” according to the team, and it took a lot of observation and measurement of the transit timing—and very complex computer modelling—to determine their densities. So, what about the water? First of all, this study didn’t detect water. It detected volatile material which is probably water. Whether or not they’ve confirmed the presence of water, these are still very important results. We’re getting good at finding exoplanets, and the next step is to determine the properties of any atmospheres that exoplanets have. This diagram compares the sizes, masses and estimated temperatures of the TRAPPIST-1 planets with Solar System planets. The colours indicate temperatures and the black line matches the densities and composition of the terrestrial planets in the Solar System. Planets above the line are less dense and planets below are more dense. Image: EXO/S.Grimm et. al. TRAPPIST 1-b and 1c are the two innermost planets and are likely to have rocky cores and be surrounded by atmospheres much thicker than Earth’s. TRAPPIST-1d is the lightest of the planets at about 30 percent the mass of Earth. We’re uncertain whether it has a large atmosphere, an ocean or an ice layer. TRAPPIST-1e is a bit of a surprise. It’s the only planet in the system slightly denser than Earth. It may have a denser iron core, and it does not necessarily have a thick atmosphere, ocean or ice layer. TRAPPIST-1e is a mystery because it appears to be so much rockier than the rest of the planets. It’s the most similar to Earth, in size, density and the amount of radiation it receives from its star. TRAPPIST-1f, g and h might have frozen surfaces. If they have thin atmospheres, they would be unlikely to contain the heavy molecules that we find on Earth, such as carbon dioxide. The TRAPPIST-1 system is going to be studied for a very long time. It promises to be one of the first targets for the James Webb Space Telescope (we hope.) It’s a very intriguing system, and whether or not any of the planets are deemed habitable, studying them will teach us a lot about our search for water, habitability, and life. Welcome back to our series on Exoplanet-Hunting methods! Today, we look at another widely-used and popular method of exoplanet detection, known as the Radial Velocity (aka. Doppler Spectroscopy) Method. The hunt for extra-solar planets sure has heated up in the past decade or so! Thanks to improvements made in instrumentation and methodology, the number of exoplanets discovered (as of December 1st, 2017) has reached 3,710 planets in 2,780 star systems, with 621 system boasting multiple planets. Unfortunately, due to the limits astronomers are forced to contend with, the vast majority have been discovered using indirect methods. When it comes to these indirect methods, one of the most popular and effective is the Radial Velocity Method – also known as Doppler Spectroscopy. This method relies on observing the spectra stars for signs of “wobble”, where the star is found to be moving towards and away from Earth. This movement is caused by the presence of planets, which exert a gravitational influence on their respective sun. Essentially, the Radial Velocity Method consists not of looking for signs of planets themselves, but in observing a star for signs of movement. This is deduced by using a spectometer to measure the way in which the star’s spectral lines are displaced due to the Doppler Effect – i.e. how light from the star is shifted towards the red or blue end of the spectrum (redshift/blueshift). These shifts are indications that the star is moving away from (redshift) or towards (blueshift) Earth. Based on the star’s velocity, astronomers can determine the presence of a planet or system of planets. The speed at which a star moves around its center of mass, which is much smaller than that of a planet, is nevertheless measurable using today’s spectrometers. Until 2012, this method was the most effective means of detecting exoplanets, but has since come to be replaced by the Transit Photometry. Nevertheless, it remains a highly effective method and is often relied upon in conjunction with the Transit Method to confirm the existence of exoplanets and place constraints on their size and mass. The Radial Velocity method was the first successful means of exoplanet detection, and has had a high success rate for identifying exoplanets in both nearby (Proxima b and TRAPPIST-1‘s seven planets) and distant star systems (COROT-7c). One of the main advantages is that it allows for the eccentricity of the planet’s orbit to be measured directly. The radial velocity signal is distance-independent, but requires a high signal-to-noise-ratio spectra to achieve a high degree of precision. As such, it is generally used to look for low-mass planets around stars that are within 160 light-years from Earth, but can still detect gas giants up to a few thousand light years away. The radial velocity technique is able to detect planets around low-mass stars, such as M-type (red dwarf) stars. This is due to the fact that low mass stars are more affected by the gravitational tug of planets and because such stars generally rotate more slowly (leading to more clear spectral lines). This makes the Radial Velocity Method highly useful for two reasons. For one, M-type stars are the most common in the Universe, accounting for 70% of stars in spiral galaxies and 90% of stars in elliptical galaxies. Second, recent studies have indicated that low-mass, M-type stars are the most likely place to find terrestrial (i.e. rocky) planets. The Radial Velocity Method is therefore well-suited for the study of Earth-like planets that orbit closely to red dwarf suns (within their respective habitable zones). Another major advantage is the way the Radial Velocity Method is able to place accurate constraints on a planet’s mass. Although the radial velocity of a star can only yield estimates a planet’s minimum mass, distinguishing the planet’s own spectral lines from those of the the star can yield measurements of the planet’s radial velocity. This allows astronomers to determine the inclination of the planet’s orbit, which enables the measurement of the planet’s actual mass. This technique also rules out false positives and provides data about the composition of the planet. The main issue is that such detection is possible only if the planet orbits around a relatively bright star and if the planet reflects or emits a lot of light. As of December 2017, 662 of all exoplanet discoveries (both candidates and those that have been confirmed) were detected using the Radial Velocity Method alone – almost 30% of the total. That being said, the Radial Velocity Method also has some notable drawbacks. For starters, it is not possible to observe hundreds or even thousands of stars simultaneously with a single telescope – as is done with Transit Photometry. In addition, sometimes Doppler spectrography can produces false signals, especially in multi-planet and multi-star systems. This is often due to the presence of magnetic fields and certain types of stellar activity, but can also arise from a lack of sufficient data since stars are not generally observed continuously. However, these limitations can be mitigated by pairing radial velocity measurements with another method, the most popular and effective of which is Transit Photometry. While distinguishing between the spectral lines of a star and a planet can allow for better constraints to be placed on a planet’s mass, this is generally only possible if the planet orbits around a relatively bright star and the planet reflects or emits a lot of light. In addition, planet’s that have highly inclined orbits (relative to the observer’s line of sight) produce smaller visible wobbles, and are therefore harder to detect. In the end, the Radial Velocity Method is most effective when paired with Transit Photometry, specifically for the sake of confirming detections made with the latter method. When both methods are used in combination, the existence of a planet can not only be confirmed, but accurate estimates of its radius and true mass can be made. Observatories that use the Radial Velocity method include the European Southern Observatory’s (ESO) La Silla Observatory in Chile. This facility conducts exoplanet-hunting surveys using its 3.6 meter telescope, which is equipped with the High Accuracy Radial Velocity Planet Searcher (HARPS) spectrometer. There’s also the telescopes at the Keck Observatory in Mauna Kei, Hawaii, which rely on the High Resolution Echelle Spectrometer (HIRES) spectrometer. There’s also the Haute-Provence Observatory in Southern France, which used the ELODIE spectrograph to detect 51 Pegasi b – the first “Hot Jupiter” found to be orbiting a main sequence star – in 1995. In 2006, ELODIE was decommissioned and replaced by the SOPHIE spectrograph. Exoplanet-hunting surveys that rely on the Radial Velocity Method are expected to benefit greatly form the deployment of the James Webb Space Telescope (JWST), which is scheduled for 2019. Once operational, this mission will obtain Doppler measurements of stars using its advanced suite of infrared instruments to determine the presence of exoplanet candidates. Some of these will then be confirmed using the Transiting Exoplanet Survey Satellite (TESS) – which will deploy in 2018. Thanks to improvements in technology and methodology, exoplanet discovery has grown by leaps and bounds in recent years. With thousands of exoplanets confirmed, the focus has gradually shifted towards the characterizing of these planets to learn more about their atmospheres and conditions on their surface. In the coming decades, thanks in part to the deployment of new missions, some very profound discoveries are expected to be made! We have many interesting articles about exoplanet-hunting here at Universe Today. Here’s What is the Transit Method? With every passing year, more and more extra-solar planets are discovered. To make matters more interesting, improvements in methodology and technology are allowing for the discovery of more planets within individual systems. Consider the recent announcement of a seven-planet system around the red dwarf star known as TRAPPIST-1. 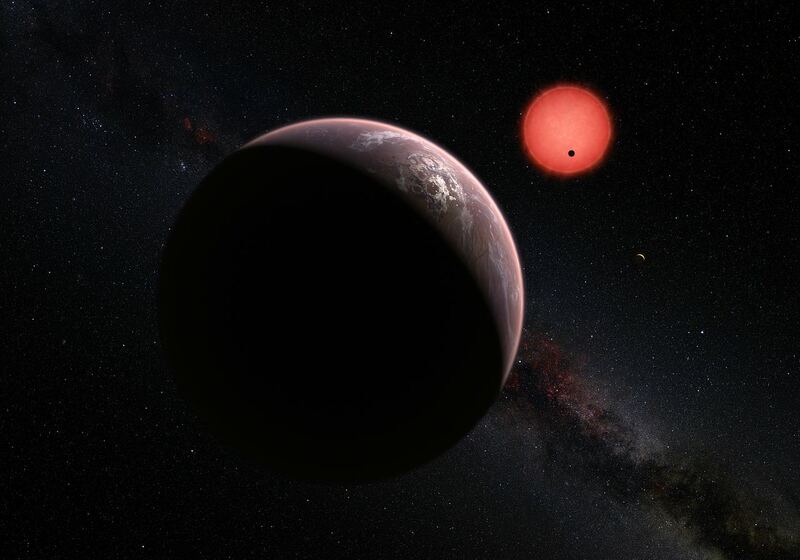 At the time, this discovery established the record for most exoplanets orbiting a single star. Well move over TRAPPIST-1! Thanks to the Kepler Space Telescope and machine learning, a team from Google AI and the Harvard-Smithsonian Center of Astrophysics (CfA) recently discovered an eighth planet in the distant star system of Kepler-90. Known as Kepler -90i, the discovery of this planet was made possible thanks to Google algorithms that detected evidence of a weak transit signal in the Kepler mission data. The study which describes their findings, titled “Identifying Exoplanets with Deep Learning: A Five Planet Resonant Chain Around Kepler-80 and an Eight Planet Around Kepler-90“, recently appeared online and has been accepted for publication in The Astronomical Journal. The research team consisted of Christopher Shallue of Google AI and Andrew Vanderburg of the University of Texas and the CfA. Kepler-90, a Sun-like star, is located roughly 2,545 light-years from Earth in the constellation Draco. As noted, previous surveys had indicated the existence of seven planets around the star, a combination of terrestrial (aka. rocky) planets and gas giants. But after using a Google algorithm created to search through Kepler data, the research team confirmed that the signal of a another closer-orbiting planet lurked within the data. The Kepler mission relies on the Transit Method (aka. Transit Photometry) to discern the presence of planets around brighter stars. This consists of observing stars for periodic dips in brightness, which are an indication that a planet is passing in front of the star (i.e. transiting) relative to the observer. For the sake of their study, Shallue and Vanderburg trained a computer to read light-curves recorded by Kepler and determine the presence of transits. This artificial “neural network” sifted through Kepler data and found weak transit signals that indicated the presence of a previously-missed planet around Kepler-90. This discovery not only indicated that this system is very much like our own, it also confirms the value of using artificial intelligence to mine archival data. While machine learning has been used to search Kepler data before, this research demonstrates that even the weakest signals can now be discerned. This newly-discovered planet, known as Kepler-90i, is a rocky planet that is comparable in size to Earth (1.32 ± 0.21 Earth radii) that orbits its star with a period of 14.4 days. Given its close proximity to its star, this planet is believed to experience extreme temperatures of 709 K (436 °C; 817 °F) – making it hotter than Mercury’s daytime high of 700 K (427 °C; 800 °F). The Kepler mission, in its first four-years in operation, accumulated a dataset that consisted of 35,000 possible planetary transit signals. In the past, automated tests and sometimes visual inspections were used to verify the most promising signals in the data. However, the weakest signals were often missed with these methods, leaving dozens or even hundreds of planets unaccounted for. Looking to improve on this, Shallue teamed up Andrew Vanderburgh – a National Science Foundation Graduate Research Fellow and NASA Sagan Fellow – to see if machine learning could mine the data and turn up more signals. The first step consisted of training a neural network to identify transiting exoplanets using a set of 15,000 previously-vetted signals from the Kepler exoplanet catalogue. The sixth planet in Kepler-80 is known as Kepler-80g, an Earth-sized planet that is in a resonant chain with its five neighboring planets. This occurs when planets are locked by their mutual gravity into an extremely stable system, similar to what TRAPPIST-1’s seven planets experience. Kepler-90i, on the other hand, is an Earth-sized planet that experiences Mercury-like conditions and orbits outside of 90b and 90c. In the future, Shallue and Vanderburg plan to apply their neural network to Kepler’s full archive of more than 150,000 stars. Within this massive data set, many more planets are likely to be lurking, and quote possibly within multi-planetary systems that have already been surveyed. In this respect, the Kepler mission (which has already been invaluable to exoplanet research) has shown that it has a lot more to offer. Naturally, the fact that a Sun-like star is now known to have a system of eight planets (like our Solar System), there are those who wonder if this system could be a good bet for finding extra-terrestrial life. But before anyone get’s too excited, it is worth noting that Kepler-90s planets all orbit rather closely to the star. It’s outermost planet, Kepler-90h, orbits at a similar distance to its star as Earth does to the Sun. The discovery of an eighth planet around another star also means there’s a system out there that rivals the Solar System in total number of planets. Maybe it’s time we reconsidered the 2006 IAU decision – you know, the one where Pluto was “demoted”? And while we’re at it, perhaps we should fast-track Ceres, Eris, Haumea, Makemake, Sedna and the rest for planethood. Otherwise, how else do we plan on maintaing our record? In the future, similar machine learning processes are likely to be applied to next-generation exoplanet-hunting missions, like the Transiting Exoplanet Survey Satellite (TESS) and the James Webb Space Telescope (JWST). These missions are scheduled to launch in 2018 and 2019, respectively. And in the meantime, there are sure to be many more revelations coming from Kepler! In February of 2017, a team of European astronomers announced the discovery of a seven-planet system orbiting the nearby star TRAPPIST-1. Aside from the fact that all seven planets were rocky, there was the added bonus of three of them orbiting within TRAPPIST-1’s habitable zone. As such, multiple studies have been conducted that have sought to determine whether or not any planets in the system could be habitable. When it comes to habitability studies, one of the key factors to consider is the age of the star system. Basically, young stars have a tendency to flare up and release harmful bursts of radiation while planets that orbit older stars have been subject to radiation for longer periods of time. Thanks to a new study by a pair of astronomers, it is now known that the TRAPPIST-1 system is twice as old as the Solar System. The study, which will be published in The Astrophysical Journal under the title “On The Age Of The TRAPPIST-1 System“, was led by Adam Burgasser, an astronomer at the University of California San Diego (UCSD). He was joined by Eric Mamajek, the deputy program scientist for NASA’s Exoplanet Exploration Program (EEP) at the Jet Propulsion Laboratory. Together, they consulted data on TRAPPIST-1s kinematics (i.e. the speed at which it orbits the center of the galaxy), its age, magnetic activity, density, absorption lines, surface gravity, metallicity, and the rate at which it experiences stellar flares. From all this, they determined that TRAPPIST-1 is quite old, somewhere between 5.4 and 9.8 billion years of age. This is up to twice as old as our own Solar System, which formed some 4.5 billion years ago. These results contradict previously-held estimates, which were that the TRAPPIST-1 system was about 500 millions yeas old. This was based on the fact that it would have taken this long for a low-mass star like TRAPPIST-1 (which has roughly 8% the mass of our Sun) to contract to its minimum size. But with an upper age limit that is just under 10 billion years, this star system could be almost as old as the Universe itself! The implications of this could be very significant as far as habitability studies are concerned. For one, older stars experience less in the way of flareups compared to younger ones. From their study, Burgasser and Mamajek confirmed that TRAPPIST-1 is relatively quiet compared to other ultra-cool dwarf stars. However, since the planets around TRAPPIST-1 orbit so close to their star, they have been exposed to billions of years of radiation at this point. As such, it is possible that most of the planets which orbit TRAPPIST-1 – expect for the outermost two, g and h – would probably have had their atmospheres stripped away – similar to what happened to Mars billions of years ago when it lost its protective magnetic field. This is certainly consistent with many recent studies, which concluded that TRAPPIST-1’s solar activity would not be conducive to life on any of its planets. Whereas some of these studies addressed TRAPPIST-1s level of stellar flare, others examined the role magnetic fields would play. In the end, they concluded that TRAPPIST-1 was too variable, and that its own magnetic field would likely be connected to the fields of its planets, allowing particles from the star to flow directly onto the planets atmospheres (thus allowing them to be more easily stripped away). However, the results were not entirely bad news. 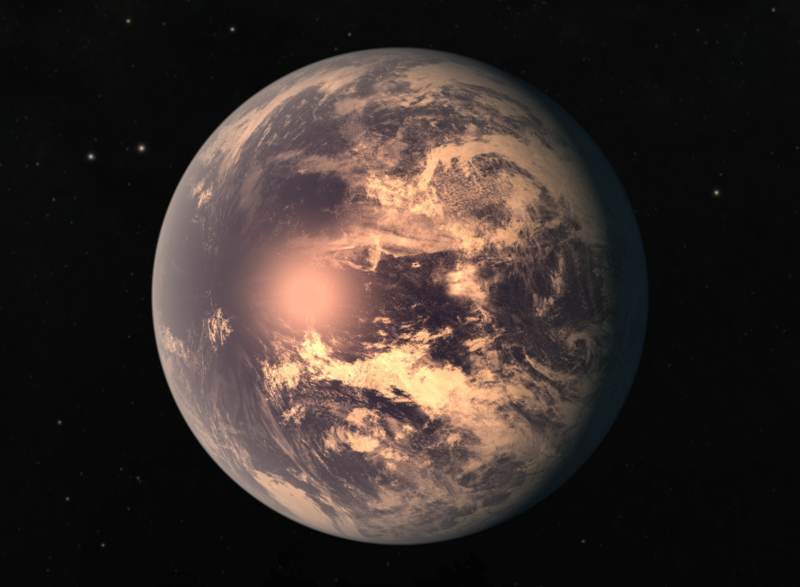 Since the TRAPPIST-1 planets have estimated densities that are lower than that of Earth, it is possible that they have large amounts of volatile elements (i.e. water, carbon dioxide, ammonia, methane, etc). These could have led to the formation of thick atmospheres that protected the surfaces from a lot of harmful radiation and redistributed heat across the tidally-locked planets. Then again, a thick atmosphere could also have an effect akin to Venus, creating a runaway greenhouse effect that would have resulted in incredibly thick atmospheres and extremely hot surfaces. Under the circumstances, then, any life that emerged on these planets would have had to be extremely hardy in order to survive for billions of years. Another positive thing to consider is TRAPPIST-1’s constant brightness and temperature, which are also typical of M-class (red dwarf) stars. Stars like our Sun have an estimated lifespan of 10 billion years (which it is almost halfway through) and grow steadily brighter and hotter with time. 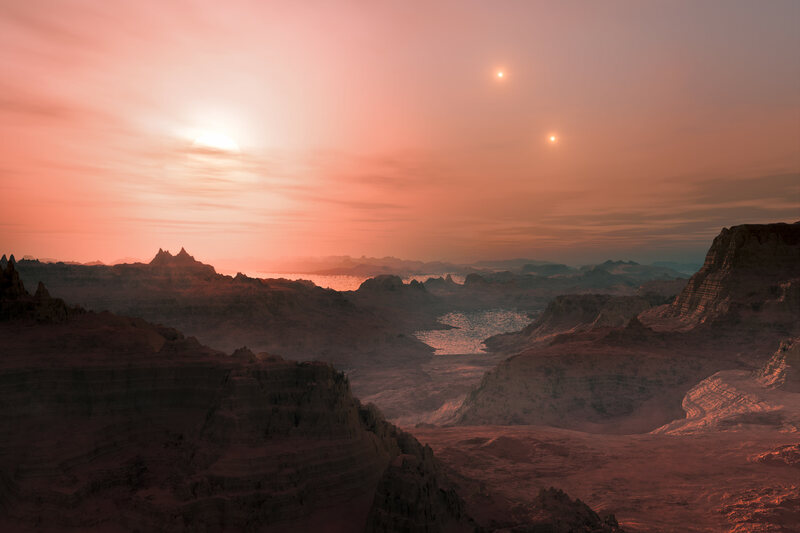 Red dwarfs, on the other hand, are believed to exist for as much as 10 trillion years – far longer than the Universe has existed – and do not change much in intensity. NASA has also expressed excitement over these findings. “These new results provide useful context for future observations of the TRAPPIST-1 planets, which could give us great insight into how planetary atmospheres form and evolve, and persist or not,” said Tiffany Kataria, an exoplanet scientist at JPL. At the moment, habitability studies of TRAPPIST-1 and other nearby star systems are confined to indirect methods. However, in the near future, next-generation missions like the James Webb Space Telescope are expected to reveal additional information – such as whether or not these planets have atmospheres and what their compositions are. Future observations with the Hubble Space Telescope and the Spitzer Space Telescope are also expected to improve our understanding of these planets and possible conditions on their surface.